Vegan Vanguard: Charging Ahead of the Mainstream: Tempeh Madness! Let's talk about tempeh. No, it's not a town in Arizona. 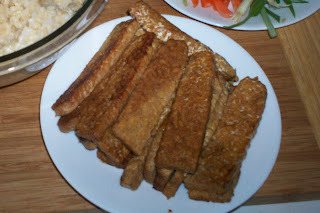 The picture above is a great example of tempeh that has been pan fried until golden brown. I'm sure by now most vegans and vegetarians know what tempeh is. Hopefully, you've tried it, and it has become a part of your diet, whether you're a vegetarian or not. JD loves tempeh's nutty texture and flavor. As a chef, I love its versatility. It can be steamed, marinated, deep fried, pan friend, baked, sautéed, simmered, braised, smoked, grilled, broiled, crumbled, used in sushi, sate, paella, gumbo, fried rice, tacos, burritos, paté, stews, stuffing, patties, and, I've even heard of people using it for smoothies! Some of my favorite tempeh dishes to prepare include Tempeh Marsala, Tempeh Tacos, a Persian dish of tempeh in a walnut pomegranate sauce, Tempeh Sushi and Tempeh Ruebens, and I love ordering Nasi Goreng with Deep Fried Tempeh locally from Java Noodles, or getting Tempeh Scallopini from Watercourse Foods when I'm in Denver. So what is tempeh? It's a soybean product. A fermented soybean patty, to be exact. I know it sounds kind of horrendous, but good homemade tempeh only has the most subtle of smells, and really only an earthy, slightly mushroomy smell. Commercial tempeh doesn't even really have a smell. Don't let the fermentation scare you, I think Americans in general are scared of fermented foods, but we unwittingly eat them every day from various sources like: chocolate, coffee beans, sauerkraut, beer, wine, yogurt, kefir, vinegar, pickles, olives, cheese, soy sauce and tamari. Recently, soy foods have been getting unfairly lumped together, but as I've stated before, soy foods are not all equal. Tempeh is frequently grouped with tofu as a meat analog or meat substitute, and although both can a great addition to vegan or vegetarian diets, they're both foods with long, rich histories. Tofu originated in China, most likely more than two thousand years ago. Tempeh originated in Indonesia, probably around the 16th century, where it was produced by the Javanese people. Both of these soy products have been the subject of cancer prevention studies. So how is tempeh different from tofu, you ask? Texturally, I always think of tempeh as the "steak" of soy products and tofu as the "cheese", although I think tempeh has much more inherent flavor. Nurtritionally, tempeh has more calcium and iron, and almost twice as much protein as tofu. Tempeh is made from whole, skinned soybeans which are soaked, partially cooked, then mixed with the Rhizopus oligosporus spore (usually called PTS for Powdered Tempeh Starter), and incubated for about 24 hours, so it's not only a whole food, but also a cultured food which (when prepared properly*) is easy to digest since the fermentation has started breaking it down, and over time it can aid digestion and help propagate good intestinal flora and strengthen your immune system. Tempeh has also been sited as a good source of vitamin B12 for vegans, although that is up for dispute. Tofu, on the other hand is a heavily refined soy food made from soaked soybeans, the raw soaked beans are blended with hot water, then lightly cooked and the soybean pulp is strained, giving you soy milk and okara (soy pulp). A coagulant is then added to the soy milk to make it curdle ( like dairy cheese), and then the curds are strained and pressed. I know that you have busy lives and sometimes it's hard enough to order take-out, let alone prepare a food that requires not only incubating and culturing for 24 hours, but also de-skinning soybeans (! ), but I'd like to encourage the more adventuresome of you to try your hand at culturing your own batch of tempeh. Why? Well, for one thing, once you get the hang of it, and set up your incubator, it's pretty easy. For another, there's a huge difference between homemade tempeh and store bought tempeh. Finally, you know how I said that tempeh could propagate good intestinal flora? Well, commercially produced tempeh is made in sterile environments, and pasteurized, so while it can be easy to digest, most likely it won't do much for your flora or immune system. In even the cleanest of home kitchens, there's a little bacteria in the air, and in this case, that's a good thing. That bacteria makes your tempeh more hardy, and when you eat that fresh, unpasteurized tempeh, your immune system reaps the benefits. And if you needed any other reasons, imagine going to bed at night and waking up to find this lovely, downy white block of tempeh all ready to prepare for your breakfast, lunch or dinner? Or maybe making something wild like chickpea tempeh, sesame seed tempeh, pumpkin seed tempeh, walnut tempeh, wakame tempeh, or fu nori tempeh? Clockwise from top left: wakame tempeh, pumpkin seed tempeh, flax seed tempeh and fu nori tempeh. Since there are already some great online guides to making tempeh, most notably this one, I'll only offer some notes and tips. To make skinning the soybeans easier, I pulse the dry beans in my food processor 1 cup at a time, until the majority of the beans are cracked (but not powdered!). This is very loud, so I wear earplugs. Skinning the soybeans is an important step, and ensures that you have firm, non crumbly tempeh. You don't have to remove ALL the skins, but you do need to take off most. Why? Well, the mycelia attaches to the outer layer of the soybeans, if that layer happens to be the skin of the beans, then as soon as you cut into your tempeh, the skins will stay attached to the mycelia, but the actual bean will pop out, leaving you with a soggy mess when you try to do anything with the tempeh. I like to crack and soak the beans in the evening, then soak them the next morning (loud noises early in the morning are too jarring for me), cook them in the evening, after dinner, so I can begin the fermentation process a few hours before bed. This way, I'm usually home from work to check on them around the time they're done fermenting. Of course, you may not work outside the home, or choose to do this on a weekend. I'm just saying that you do need to take into account where you'll be between about hour 18 and 24. I've experimented with using vinegar along with the starter, and it's never worked, so I just use PTS and the soybeans. I've never tried brewer's yeast, but I've heard that others do. Experiment with small batches and see what works best. I like culturing the tempeh patties in zippered, sandwich size plastic baggies. I use a fork with thin, sharp tines to poke holes in the bag for ventilation, usually three rows of four. The baggies make the finished tempeh cakes easy to handle and store and means that the tempeh is already divided into portions. If I'm making large batches all at once, I chill the tempeh cakes in the fridge, and once they are cool, put them into gallon sized freezer bags and freeze them. For general use, I put about 1 1/2 cups into each baggie, which is about 3 or 4 servings. Make sure you have a warm, dry place all prepped BEFORE you begin boiling the beans. Optimal incubating temperature is about 85, so your home's normal room temperature might be perfect. If not, the oven, top of the refrigerator, above the dryer, etc. might be good spots. I use my oven, turned off, with the light on. I like to dry the partially cooked soybeans on large flour sack towels, because terry cloth towels can leave fuzzy lint threads, that can look like hair. Not appetizing. I'm still experimenting with adding things to my tempeh, but 2-3 teaspoons per 1 1/2 cups of tempeh seems to be a good amount for small seeds like sesame or flax. Additions should be dry, room temperature, and at least as small as the beans, so nuts or seeds can be roasted, toasted or soaked, but cool and toweled dry like the beans. For sea vegetables, I've had good luck cutting them into small bits and adding them dry. I think if you reconstituted them, they'd be too slick and add too much liquid. For the bean mixtures, I think it's a good idea to boil them separately so that you have more control over how soft they become. I made a mostly chick pea version that was very nice, although JD didn't like it (R, who has a soy sensitivity, loved it) . The chickpeas are drier and almost pasty, but I enjoyed it very much, and I think it would be great for people with soy sensitivities. I know you can make soy/grain tempeh, but I haven't done this. I'm not a fan of the Lightlife and White Wave versions, so I don't see a point in trying it at the moment. Glamour shot of the pumpkin seed tempeh (which happens to be my favorite so far). *Please note: since the soybeans for tempeh are only partially cooked, it's very important that you always cook any commercially produced tempeh for at least 20 minutes in order to make it digestible. I've noticed that my tempeh is always much more tender and the beans are much softer, so I think cooking homemade tempeh for 10 minutes is probably sufficient. Your blog is incredible. This is a superb post! i am going to be coming back for more. Thanks for being your cool way... very refreshing! Great post, thanks for pointing me to it! It'll surely help if I make tempeh! I just stumbled on your blog and I LOVE it! Just wondering if you could help me out.. I'm wanting to make some tempeh of my own, and have found a few places online to get the spores, but I was wondering if you knew a place in Austin to get the them? Thanks! -Lacey, thanks for the kind words. The only place I know of that has ever sold powdered tempeh starter in town, is the Natural Epicurean store, but the inventory has changed a bit since they partnered with White Crane, and I'm not sure if they're still carrying it. If not, they might be able to order it if you request it. As far as I know, GEM Cultures is the best place to get PTS in the US. They're really reasonable, but you do have to order well in advance of when you plan to actually make your tempeh. --Micah, I have no idea what it cost in the Philippines, as it would vary greatly based on how much TPS would cost (I don't even know if it's available there), and how much the beans would cost. I'm also not sure if you're talking about making it at home, or commercially, and making it commercially would require rental space, building or acquiring an incubator, etc. We make unpasteurized Tempeh locally in Austin, TX in fact Java Noodles is now using our Tempeh in their amazing dishes! Animal Lovers in Austin, Rejoice! Unless otherwise stated, all images and writings are copyright and property of Christina Terriquez and should not be used without expressed permission.